Poison ivy, poison oak, and poison sumac are plants that can cause a skin rash upon contact. The red, itchy rash often shows up in lines or streaks and may cause fluid-filled blisters or large, raised hives. The rash is caused by an allergic reaction to an oil in poison ivy, oak, and sumac. The rash may occur when your child touches the plant or clothing, pet fur, sporting gear, gardening tools, or other objects that have come in contact with one of these plants. Your child cannot catch or spread the rash, even if he or she touches it or the blister fluid, because the plant oil will already have been absorbed or washed off the skin. The rash may seem to be spreading, but either it is still developing from earlier contact or your child has touched something that still has the plant oil on it. If your doctor prescribed a cream, use it as directed. If the doctor prescribed medicine, give it exactly as prescribed. Call your doctor or nurse call line if you think your child is having a problem with his or her medicine. Use cold, wet cloths to reduce itching. Keep your child cool and out of the sun. Leave the rash open to the air. Wash all clothing or other things that may have come in contact with the plant oil. Avoid most lotions and ointments until the rash heals. Calamine lotion may help relieve symptoms of a plant rash. Use it 3 or 4 times a day. If you know your child may be exposed to poison ivy, oak, or sumac when playing outdoors, learn to identify these plants and teach your child to avoid them. Dress your child in long pants, long sleeves, and closed shoes to help keep the oil from getting on your child's skin. Wash well or throw away anything that came into contact with the plants. You can use an after-contact product, such as Tecnu Original Outdoor Skin Cleanser, to clean plant oil from your child's skin, clothing, or toys. Be sure to have your child wash his or her hands before and after using the washroom. Red streaks leading from the rash. Pus draining from the rash. 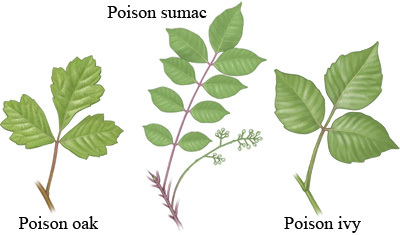 Enter R114 in the search box to learn more about "Poison Ivy, Oak, and Sumac in Children: Care Instructions".